Remember lunch breaks? When’s the last time you (or any one of your coworkers, for that matter) took one? According to recent research, only one in five people are setting aside time during the workday to eat lunch. Most of us are sitting at our desks, grinding through our lunch hour to accomplish more tasks. Slang terms like “desktop dining” and “dining al desko” drive home the point. This is a real thing—and a problem. And it’s not only bad for our health. It’s also bad for business. In a study of 20,000 U.S. managers and their teams by Harvard Business Review and The Energy Project, 40% said they felt more engaged and creative than those working through their lunch breaks. 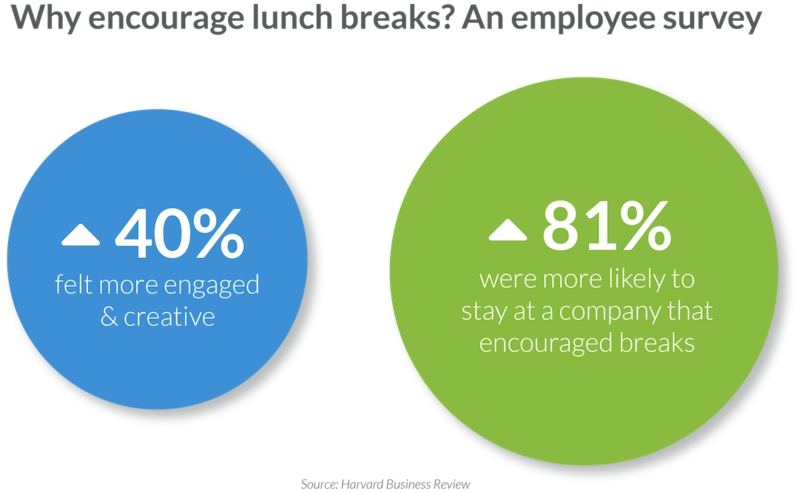 81% admitted they were also more likely to stay at a company where lunch breaks were encouraged. It’s crucial for your leadership team to set a good example. Put employees at ease by encouraging breaks. Even better? Make it easy for your team to take breaks together to unwind and bond. But even a well-intentioned leader might receive pushback from employees who have a habit of eating alone at their desks with their sad lunches. Not the working team lunch, but the team-building kind that magically takes “dining al desko” out of the equation while boosting your company’s culture. Here are some ideas to help strengthen the bond between your team members by facilitating a team lunch. Lunch and learns are a great way for employees to teach what they know, growing the skill sets and confidence of the entire team. If these are too formal, however, they risk boring the team or causing anxiety for the presenter. Inviting coworkers to share a cool shortcut or tool, present a productivity hack, or share educational visual content like a video or webinar can bring value to other team members without being overly formal. Considering the hours we spend at work, you’d be surprised how many employees and executives know very little about each other. Small businesses are just as guilty of this as larger ones. Use your lunch as a chance to really get to know each other and “meet” on a very different level. Presenting a theme like “Where is your favorite place to travel?” or “What would your spirit animal be?” for each team lunch will provide enough of a boundary to keep the conversation focused, and reveal personal tidbits you and your team may have never discovered otherwise. 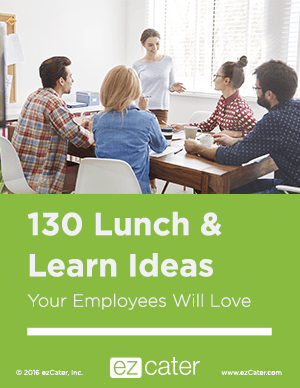 Make your team lunches productive with these lunch & learn topics. Employees go on vacation. They have children. Sometimes they take unexpected leave. No matter what your company’s circumstances, the work still needs to be covered. Rather than leaving one employee to take on all of the extra work, talk it out over lunch. That way you can divvy up the workload and ensure everything is handled without overwhelming anyone. Or, if your company is struggling with something internally—say, if sales are low—try role-playing over lunch to fine tune pitches and buck the negative trend. Games for all ages can instantly lighten the mood and create a bonding experience. You can spin a classic game into one that’s relevant to your business (e.g. Jeopardy or Trivia). Another fun, work-related game is to play “startup” by challenging your team to work with a partner to create a business in 15 minutes, and then try to sell it to the rest of the team. Ideas will flow that might even benefit your business. The lunch hour doesn’t have to be lonely, or non-existent. Team-building lunches are a golden opportunity to make a positive impact on your culture, and turn your employees into advocates for your company. How does your company do team lunches? Let us know in the comments below. Are Food Trucks Killing the Sad Desk Lunch?